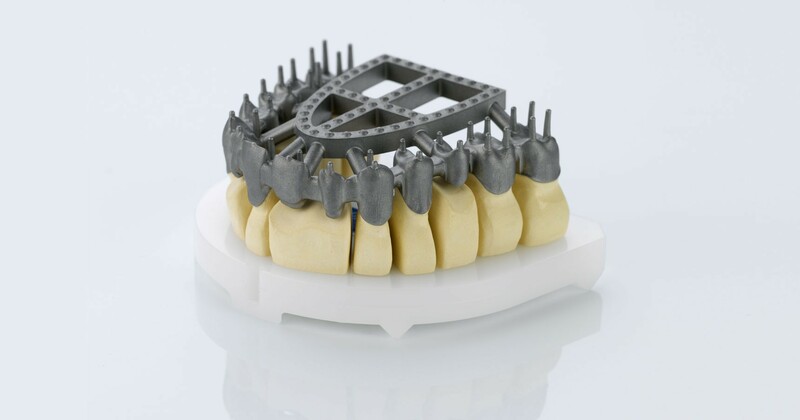 Ceramill Sintron framework placed on the FSD after sintering. Another anatomic reduced case in the green body state. Zirconia & sintering metal – both materials essentially have the same sintering method: Homogeneous sintering shrinkage and uniform condensing of the material at specific sintering temperatures, in combination with correctly calculated expansion factors from green-body and final density determined beforehand, ensure the desired fit after the sintering process. However, a set-up such as with zirconia bridges on sintering beads cannot be undertaken 1:1 to produce accurately fitting, distortion-free frameworks – particularly in the case of long-span restorations fabricated using sintering metal. 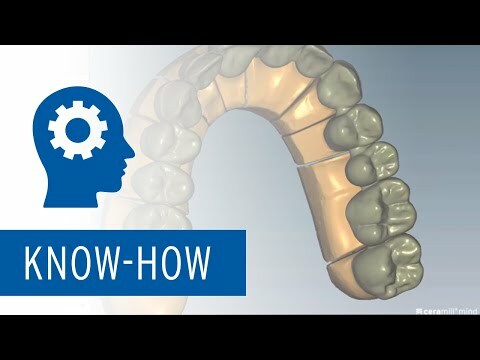 This is because there is a major difference: The green-body density of powder metal is almost twice as high as with partially sintered zirconia. This increased weight with the restoration to be sintered requires ideal support in the shrinkage process during sintering. The reason is that during the condensing process, a significant length of time must be covered with dimensional accuracy despite the force of gravity on solid pontics next to delicate crowns, and despite the pressure of sintering beads between framework structures. We have developed the principle of float sintering to enable optimum, parallel condensing and shrinking: This method provides rigid support of the framework with simultaneous, virtually unhindered volume shrinkage by sliding the framework to be sintered on a milled disc, fabricated from high-performance ceramic (FSD). Occlusal sintering drops: The round surfaces on the tips provide a minimum support surface and therefore low frictional resistance. In addition, the conical widening with increasing length has a stabilising effect. The drops can be removed by simply nipping them off. Stabilisers: Additional sliding structures on the surface, providing a minimum support surface. Framework-like contour to align the mass and geometric proportionalities to the dental technological framework. This offsets volume ratios during shrinkage. The stabilisers are removed using a cut-off disc after sintering. Interested in the details of the design process?